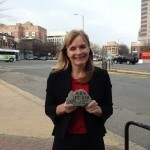 Meet Karen Diener, a good friend from Clarendon, super experienced mountain climber and newest volunteer to be part of the Living Memorial of The Summit Project. In less than a week, Karen will leave the US for her biggest expedition yet –– a journey to Mt. Everest, the highest peak on the face of the earth. She will hand carry the memorial stone and memory of Army SFC Aaron Henderson, Houlton, Maine, to the base camp of Mt. Everest and tell everyone she meets about Aaron’s courage, service and the mission of TSP. Thank you Karen. Thank you for honoring the fallen while challenging the living. Maine heroes are not forgotten. From WABI TV 5 Caitlin Burchill’s story, May 21 — Sergeant First Class Aaron Henderson wasn’t scheduled to go to Afghanistan, but the Hodgdon native wanted to be there with a younger group of soldiers. Henderson died from IED injuries on October 2nd, 2012. He was 33-years-old. While Henderson’s life ended too soon, his story of selflessness will be shared forever, partly because of The Summit Project. “Well I’ll be honest, I just didn’t think much about it. I thought,you know a rock. Okay. It didn’t mean anything to me. I was too deep into the grieving process,” said Aaron Henderson’s mother Chris. Almost a year after her son’s death, Chris Henderson was asked to choose a memorial stone for The Summit Project, a program that memorializes Maine soldiers killed in the line of duty since September 11th. “I think some people thought it was a wonderful idea from the get go, but it took me awhile to process it,” she said. She picked a rock from property Aaron had purchased next to her’s in Hodgdon. “It just brought the whole farm back together again and he had plans to, when he retired, to probably come back there and build a little house on that land,” said Henderson. 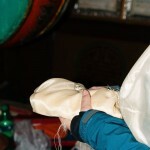 While the stone didn’t mean much to her at the time, she had no idea where it would travel one year later. “Mt. Everest, oh my goodness Mt. Everest. I just thought Mt. Katahdin was what they were going to do. I didn’t know all of these other places, but Mt. Everest, wow. That was incredible,” she said. 56-year-old Karen Diener just got back from her second Mt. 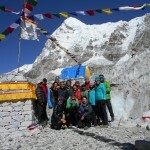 Everest base camp trek. This time, she brought Aaron with her. “She just said it would be an honor for her to do this in memory of my son. She said from what I understand he was a wonderful soldier and I said yes, as wonderful soldier he was he was an even better son, so for you to do that in memory of him means a lot to me,” said Henderson. 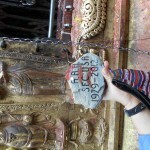 Diener and her team took the stone to Kathmandu. 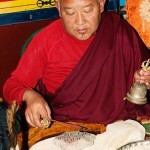 It was blessed by monks at a monastery. 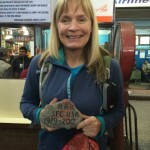 Karen also took the stone with her when she climbed to a higher camp at 20-thousand feet. “Nobody really talked about Aaron in the past tense at all. We spoke about him like he was with us in the present and his spirit leading us,” she said. 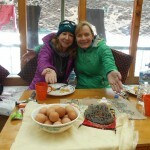 Her crew got to base camp, four days after avalanches killed at least 12 people. That’s where she met up with her friend and one of the world’s most elite climbers, Damian Benegas. He was one of first ones on scene to help rescue people off the mountain. “I thought about Aaron, how appropriate in his special ops role, all the people that he would selflessly risk his own life to save and all the awards and stuff he had. It was a similar type of person that Damian Benegas. No thinking of themselves. So it was pretty cool that we had Aaron with us,” said Diener. Karen told Damian about Aaron, “Our whole group, including our Sherpa people and everywhere we went knew Aaron and knew his story.” While Chris says Aaron probably wouldn’t have liked the attention, she’s happy his memory lives on. “It’s awesome to think about his story being told in a lot of places, not just here. Obviously the people he grew up with and my family and all of the people here will remember him, but I think it’s an awesome thing to think that people from other countries are going to hear about him,” she said.